When you breathe and use your power center correctly, you can open the voice like a "delicate flower". When this happens the fibers of the voice can gently open again. This brings the pure and innocent memory of the voice into being. As the sounds and tones are pure vibration and you are coming from your own power it is "you" that you trust. This tune's-up your whole being and brings you into balance. I have experienced profound positive changes in both the voice and lives of my students. "I deeply enjoyed Dolli's "Yoga for the Voice" lessons. The way to my own voice was an exciting journey to find and bring out what was hidden for a very long time. The power lies in the voice. 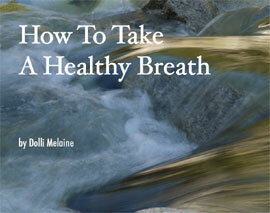 I learned how to nourish every cell in my body with my breath which encouraged the voice to be totally present. I also took private yoga lessons with Dolli and I found that my spine remembered its upright and flexible position. Dolli encouraged me to focus and feel my center. Now I know how to balance myself with each step along my path. My inner strength and power are present and I am "at home" in my body. I am deeply grateful for this wonderful gift." "As an Art Therapist, I have done alot with different medias ie: painting, music etc. Dolli's Voice Opening classes were not only voice training for me but much more. I found a new body consciousness, a new attitude towards my breathing and the fun in singing. The professional way she teaches gave me so much trust that it became really fun to experiment with my voice and body. Dolli helped me not only in opening my voice but also in opening my body and as a result of this, I also noticed a profound "inner development". "Previously it was unthinkable for me to ask for something in a shop. So I always had to write what I wanted on a sheet of paper. After that I always felt unhappy and weak. Now I don't have this problem anymore, it has faded away. I am much more confident and enjoy talking. I have trained and learned that it is easy to use my speaking voice! Dolli Melaine's voice opening method has helped me so that my severe problems with stuttering have disappeared and now I am much happier and more carefree in my life! Thank you very much Dolli!" "Dolli and I have been working together for the past few months and she has been incredible to work with. She has helped me to improve a voice issue I've struggled with for over 12 years. I have every confidence that with her help I will be able to speak freely, putting this issue behind me for good. That's saying alot since the diagnosis of Spasmodic Dysphonia is seen as "not curable" by the medical industry. This in itself is fantastic but there has been another benefit that I did not expect from working with Dolli. I have lived with back pain from disc issues for several years now and by applying her breath work and strengthening of my power center through better posture, my back has improved greatly. I've had numerous days pain free and I'm feeling like my strength is returning. What a side benefit of what I thought was simply voice work! There is much more to Dolli than I can go into but suffice it to say that I am grateful to have met her and had the good sense to choose to spend time working with her. I have greater hope for my future, since I know I will have my full voice back, have improved my back without surgery and gained an understanding of where my true power comes from. Thank you Dolli! I owe you my gratitude." *Since this was written she is now taking singing lessons as she is singing in a band!